You've heard of climate change, but what exactly is climate? Climate is the average weather – like the temperature, wind, and rain – across seasons and decades. Like weather, climate changes but over long periods of time. To figure out these changes, you need to collect a lot of data from the air as well as the ocean. In order to collect data from the ocean, scientists have deployed a fleet of underwater floats – called ARGO – at more than 3,000 spots around the world. The float rests at the surface of the water and its location is calculated. Then it sinks 1,000 meters. As it moves through the water column, special sensors on board record the pressure, temperature, and salinity, which means the amount of salt in the water. Monitoring the pressure tells scientists the depth that the temperature and salinity measurements were taken. After 9 days, it drops down another 1,000 meters. As it climbs back up to the surface, it continues recording the pressure, temperature, and salinity of the surrounding water. When it gets to the surface, the float’s data and location are transmitted back to research centers by a satellite. One way that scientists use this info is to create ocean temperature maps: red shows warming and purple shows cooling. When recent data is compared to long-term records, a warming trend is revealed. In the future, data from Argo will be able to tell us how much and how quickly the ocean is warming. And this important work helps us better understand climate and our changing planet. 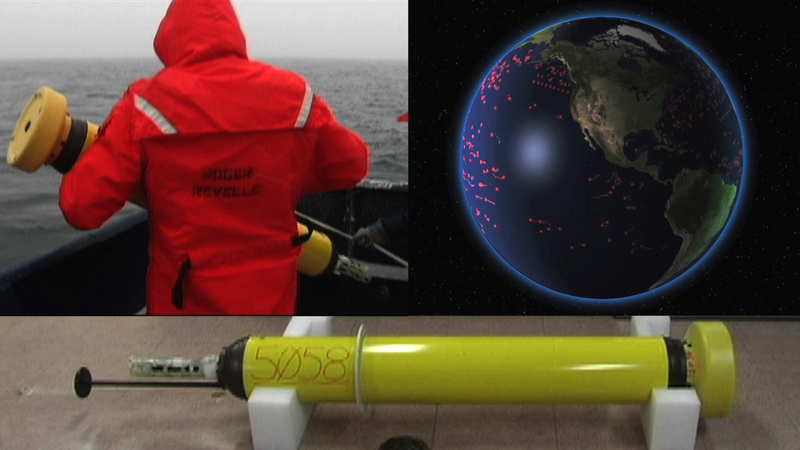 As of June 2013 there are 3,657 Argo floats throughout the ocean. 23 countries participate in the Argo program. Argo floats are operated by batteries that last nearly 4 years. Argo floats are named for the ship that Jason and the Argonauts set sail in to search for the Golden Fleece as told in Greek mythology. Argo floats gather approximately 120,000 temperature, salinity and depth profiles throughout the world’s oceans every year.